As designs students we are trained to understand how design solutions could be potentially disastrous in our future society or have no impact at all. Without going through the whole design process, a small element could be left out and change the whole outcome of the design negatively, creating a negative parallel reality. Our stylistic interpretation of the butterfly effect is a metaphor for such parallel realities. The butterfly effect is often defined as being a situation of incredible magnitude that can be caused by any one small event. To illustrate this, we chose a collection of 15 contranyms, words that contain two meanings, these two meanings are the opposite meanings of one another (connecting or disconnecting). We illustrated these words alluding to the complexity of the Lorens pattern and the Mandelbrot fractal in simple icons. The main symbol is made up of both its opposite meaning words while the symbols for the meanings themselves are split in two from this main word to oppose each other visually. 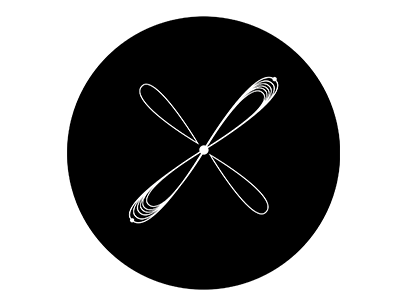 With 45 different inputs for a system, the butterfly effect has innumerable possibilities, leading to infinite parallel worlds, the icons represent how a misrepresentation of one word can change an entire system. Dominique is a South African born, third year Multimedia design student from Greenside design center. She has a great interest in independent animators of personal experiences or private philosophical thoughts to share or global problems to identify. Eva-Marie is a 22-year-old multimedia designer, she is half German and half South African. She loves music animals and cares about sustainability. She has a passion for user experience design. Her favorite thing about design is that there is always more than one way to do something: an opportunity for innovation. The butterfly effect is something she is constantly aware of during the design process as design decisions made effect how users will experience and perceive design solutions. Chante is a 3rd year Graphic Design Student, She has a passion for out of the box design solutions and creating unconventional design, that doesn’t not tend to follow trends but to be unique in a world full of designers. She is passionate about illustration and icon design.